House MD Episode Guide: Season 3 #306 "Que Sera Sera"
Third Season Episodes :: #306 "Que Sera Sera"
We apologize that we haven't yet done this page. We are trying to keep up with the recent episodes but that delays the some of the older ones. 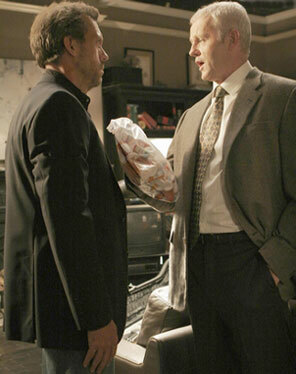 Tritter (guest star David Morse) confronts House after he's searched his (Hugh Laurie) home and finds more evidence of narcotics abuse in the HOUSE episode "Que Sera Sera" airing Tuesday, Nov. 7 (9:00-10:00 PM ET/PT) on FOX. 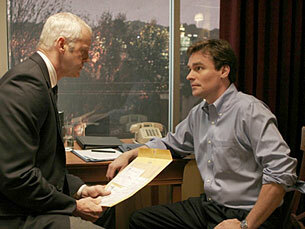 Tritter (guest star David Morse) shows Dr. Wilson (Robert Sean Leonard) some incriminating evidence against House in the HOUSE episode "Que Sera Sera" airing Tuesday, Nov. 7 (9:00-10:00 PM ET/PT) on FOX. An Analysis of the medicine from "Polite Dissent". Guest Cast: David Morse as Michael Tritter; Pruitt Taylor Vince as George; Stephanie Venditto as Nurse Brenda; Kadeem Hardison as Howard; Mary Elizabeth Ellis as Sophie; Cooper Thornton as John; Damien Dante Wayans as Haller; Jim Vickers as Folman; Denver Dowridge as Garcia; Richard Chance as Reilly; Bruno Amato as Lt. Smith; Ryan Brockington as Rookie; Michael James Faradie as Paramedic; Alan Frazier as Vagrant; Bobbin Bergstrom as Nurse.